To meet their responsibilities as plan sponsors, employers need to understand some basic rules, specifically the Employee Retirement Income Security Act of 1974 (ERISA). ERISA sets the fiduciary standard of conduct for those who manage an employee benefit plan and its assets. The financial consultants of Engler, Garrow & Roth, Ltd. are uniquely qualified to help employer-provided retirement plan sponsors implement and maintain a retirement plan while fulfilling their ERISA fiduciary obligations. 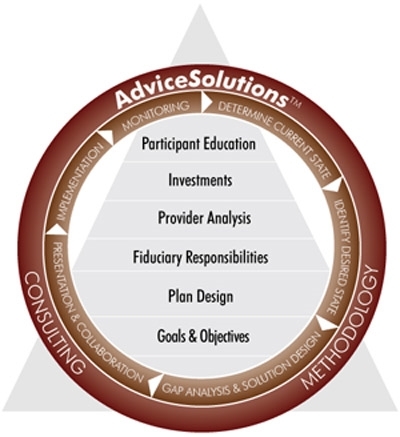 Utilizing our proprietary AdviceSolutions™ Consulting Methodology, we provide a variety of consulting services aimed at helping plan sponsors spend less time maintaining their retirement plans in compliance with appropriate regulations, so they can spend more time focusing on managing and growing their business. Every plan sponsor has a unique set of goals and objectives. From the outset, it is important to understand what those goals and objective are. A goal could be to attract and retain the highest caliber employees. Another goal could be to offer significant assistance in helping employees prepare for retirement. Often a fundamental goal is to reward the owners and/or other highly compensated individuals disproportionately to the rank and file employees. There are many competing and sometimes complementary goals for establishing a retirement plan. However, until those goals are clearly identified and prioritized, it is impossible to implement an effective retirement plan. We can help you clarify and prioritize your retirement plan goals and objectives so that an effective plan meeting those objectives can be designed and implemented. A retirement plan sponsor must act as a prudent expert under the Employee Retirement Income Security Act of 1974 (ERISA), and is held to a fiduciary standard of care with respect to plan-related decisions regarding investments, service providers, plan administration, and general ERISA compliance issues. Analyzing employee demographics and the current plan lineup to recommend an appropriate mix of asset classes and investment styles that can address the needs of participants with varied investment goals, life-stage challenges and investment knowledge.